Known as the mythical birthplace of Aphrodite, the goddess of love and beauty, the sunny island nation of Cyprus lies in the Mediterranean Sea, close enough to Turkey, Syria, and Egypt to have acquired a tinge of Middle Eastern culture. Its golden sandy beaches, crystalline waters, green forests and lovely towns draw over 2.4 million tourists a year. A member of the European Union, Cyprus has a large English-speaking population owing to the fact that it was once colonized by the British, among other nations who desired it for its strategic location and its natural resources. Inhabited and invaded for over 10,000 years, Cyprus is rich in historic places and structures, from Roman villas to medieval castles. Many of its Byzantine churches and three of its towns have been declared UNESCO World Heritage Sites. Cyprus is a modern nation with a robust economy and an especially low crime rate. The capital is Nicosia, an urban sprawl surrounded by the glorious Kyrenia mountains in the middle of the country. This bustling city is over a thousand years old, with remnants of its varied past still in existence, including its Venetian fortifications that date back to the late 16th century. Nicosia is a divided city. The northern part is occupied by Turkish Cypriots, and the southern half by the Greek Cypriots. The two communities were separated due to riots between them in the 1960s, but since 2008 there have been attempts to reintegrate them. Nicosia is the financial and political centre of the country. 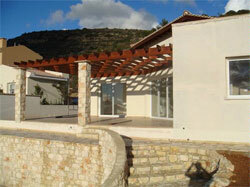 There has been considerable residential property development in Cyprus. Prices for these properties, many of which have sea views, have been rising steadily over the past five years. The principal towns offer lively nightlife and plenty of good dining opportunities. Cypriot cuisine is a rich, delicious blend of Greek and Turkish cuisines, featuring spicy food, grilled dishes. Popular ingredients include lamb, seafood, chicken, olives, citrus, and grapes. A common sight on Cypriot tables is the mezedes, or meze, an array of dips, vegetables, fish and meats in small dishes. Cypriots finish off their meal with strong black Turkish coffee. Cyprus is the third largest Mediterranean island and a popular tourist destination, attracting over 2.4 million tourists per year. Once a British colony, Cyprus became an independent republic in 1960 and a member of the Commonwealth a year later. It has one of the most thriving economies in the region.